BookMacster - приложение синхронизирует закладки между браузерами: Safari, Firefox, Chrome, Camino, iCab, Opera и OmniWeb, а так же в Интернет с Delicious, Pinboard, и Google Bookmarks. BookMacster поддерживает теги, комментарии и ссылки и в любой момент времени доступны в строке меню. Все закладки можно отсортировать по алфавиту, проверить на наличие "мертвых" ссылок, дубликатов и т.д. Приложение поможет вам обмениваться ссылками через Интернет, с кем угодно и на любой платформе. Уникальный сервис прямого поиска из различных источников, в том числе: EndNote, PubMed, Web of Science, JSTOR, Google Scholar, Amazon, Library of Congress, arXiv и др., поможет найти любые данные только что опубликованные в Интернет. This update is **necessary for all users of macOS 10.14**, due to the upcoming macOS 10.14.4 update from Apple. This update fixes failures to import from Safari, export to Safari, and in some cases save new .bmco documents, in macOS 10.14.4. Imports and exports with Safari work when running in macOS 10.14.4. The failure when using older versions is usually with Error 772042. Fixed a bug which sometimes required app to be force quit, with a false Error 992544, after saving a new document for the first time, particularly in macOS 10.14 and even more particularly in macOS 10.14.4. Bug fixes, efficiency and performance improvements to automatic syncing. In the document window tab Settings > Syncers > Advanced, the Perform…button, whose operation was sacrificed in the rush to release version 2.9, works again. 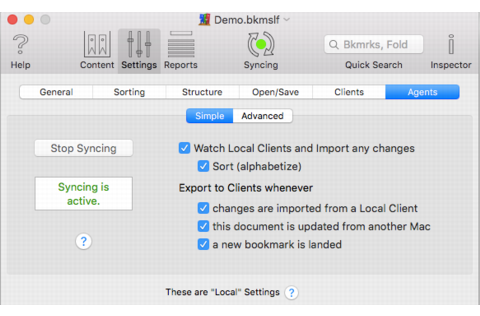 In Preferences > Syncing > Sound Effects, user may now choose their own .aiff files as custom sound effects. In document window tab Content, when in Outline Mode, items may now be dragged and dropped anywhere, including at the root level. The Sync Snapshots feature now works in macOS 10.14. Fixed crash which would occur for most users after menu command Reset and Start Over… had executed. Fixed bug introduced in a recent version which caused documents to not be completely forgotten after they wre found to be no longer available, resulting in false error indications. Trashing a document with File > Close and Trash no longer causes File > Recent Documents when running in macOS 10.14.